Six years after the successful introduction of the first Hall index typewriter (See Hall New York), the Hall company introduced an 'improved' machine, from its new place of venture in Salem, Mass. The most striking difference between the two models is the fact that the body of the machine is no longer nickel-plated, but blued. The Salem model worked basically the same as the earlier model. Two mechanical differences are the fact that the Salem model has a special handle to release the carriage, and the bell of the machine is now attached to the right margin stop. 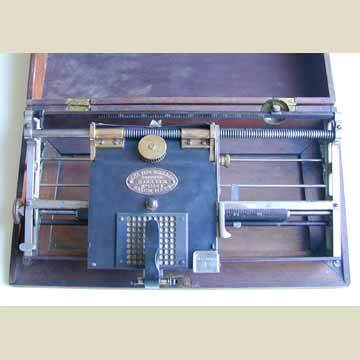 In some of the pictures, the machine appears with a small accessory: a separate index card that could be attached to the top of the machine for a more convenient way of selecting letters. Around 1890 the Hall factory moved to Boston where a virtually identical machine was produced with a square name plate on it, generally referred to as the Boston Hall.